Breaking news . . . A baby’s first encounter with technology may not be your smartphone! More likely, she or he will grab for their first baby board book. After all, pictograms on rocks and cave walls were the first technology we invented to help us communicate. And, just like smartphones, children’s board books sales are increasing according to a recent Publishers' Weekly article. Are you interested to self publish a board book? To get you started, here are a few main guidelines about setting up and printing children’s board books, and how they are different from children’s picture books. When you flip open a board book, it starts as a 2-page spread. Page 1 is a left-hand page (on the reverse of the front cover). Page 2 is a right-hand page facing Page 1. The last page of a board book is a right-hand page (on the reverse of the back cover). Here is a template for a 7-spread / 14-page board book (not including the cover). 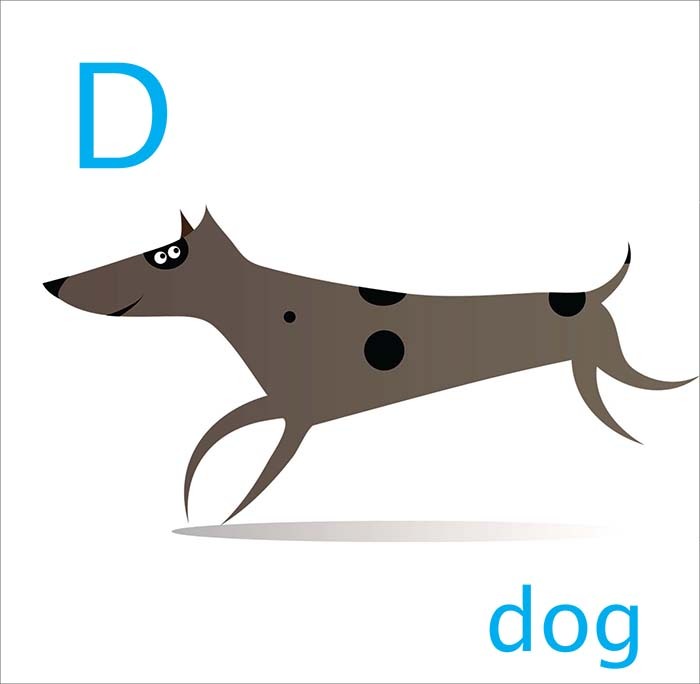 When setting up your board book design, choose facing pages in your layout software. When generating the PDF for printing, choose “Spreads” to generate the final printing files. Kids’ board books are usually between 8 and 12 spreads (16 to 24 pages) with color pictures, and either no text or text up to about 300 words. Self publishing children’s board books means you are targeting children aged 1 to 4 years’ old. Keep the book size small so a toddler can more easily hold and manipulate the board book. A smaller page size also keeps young eyes focused on one main image/concept per page. The average size board book is around 6 x 6 inches square. Gray board is pressed cardboard made of gray fibers and a white laminated surface. White board (aka white art board) is pressed cardboard made of white fibers and a white laminated surface. It is higher quality and more expensive than gray board. 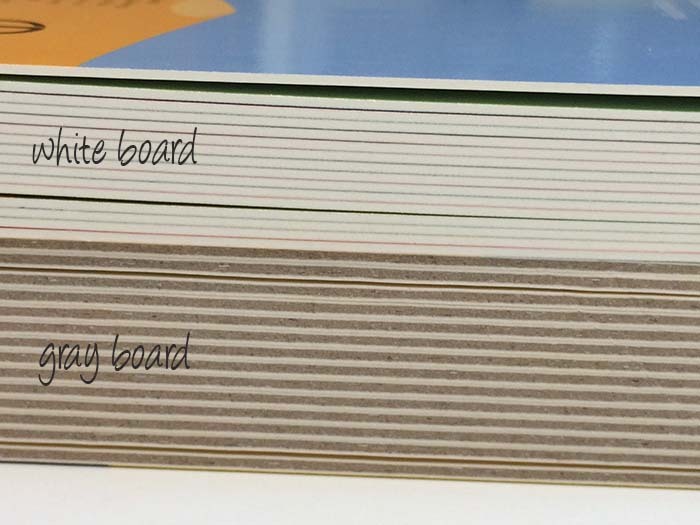 You can tell the difference by looking at the edges of the cardboard from the top or side of the board book. White board will have white edges, while gray board will have . . . you guessed it, gray edges! Paperboard is usually specified in gsm (grams per square meter). The higher the number, the thicker the cardboard. Generally, 350 gsm to 400 gsm provides enough thickness to resist bending, chewing, and throwing. (Wow, that kid is going to be some discus thrower one day!). A board book cover is usually made of the same artboard as the text, referred to as a self cover. 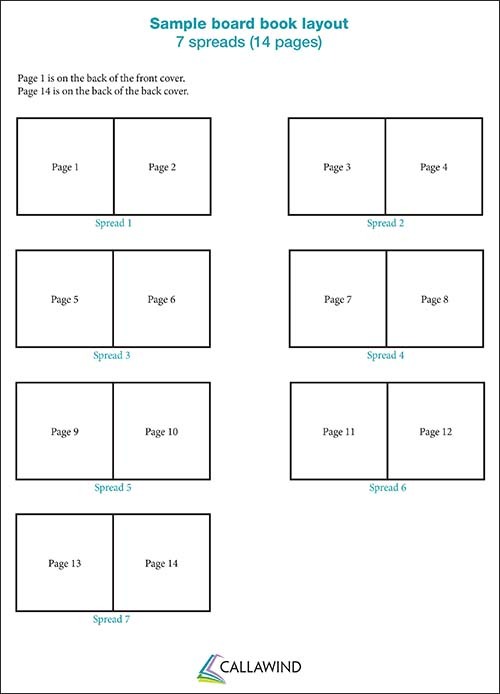 When specifying the number of spreads/pages in your board book, you don’t need to include the cover in your spread count. The cover design is prepared in a separate file, with the back, spine, and cover laid out together. 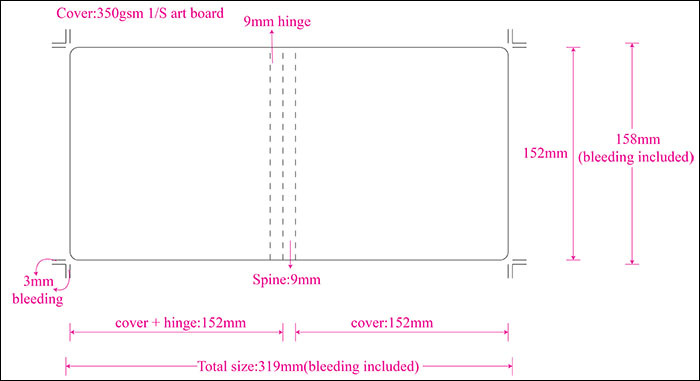 Once you have confirmed the paperboard type and number of spreads for your board book, we supply a cover template to set up your artwork with the correct spine width and bleed measurement (for pictures that extend past the page edge). Board books have a hinge near the spine on the back cover to enable the book to lay flat when open. In the example above, the hinge is 9mm from the spine. Avoid placing any text, images, or the ISBN barcode on or too close to this hinge. If you prefer the look of a hardcover, you can choose to produce the board book with a hardcover and case binding—kind of like a hybrid board book-picture book. The hardcover will be slightly larger than the spreads rather than being flush with them. Printing and binding toddler books is a specialized process. It’s best to work with an experienced board book printer who has the right equipment and easy access to the right paperboard. Most likely, you will be printing your board book cover and interior in 4 process colors (aka CMYK, 4 color, full color). Both your cover and interior spreads must be prepared as CMYK, not RGB (which only applies to screen colors and is usually not used for offset commercial printing). In offset 4-color printing, your artwork will pass through these 4 different ink stations. Check out the quick primer on Lifewire.com about the differences between CMYK and RGB. For black text, it's best to use 100% black (C = 0; M = 0, Y = 0; K = 100%). As the paper moves through the offset printing press, there can be a slight shift on press. If you use a mix of CMYK to create black (aka rich black), the text may not appear crisp and you might see other colors slightly overlapping the text. Board books shouldn’t use plastic lamination to protect the cover and spreads. There is a risk that the lamination could peel and get swallowed by accident. Instead, safety calls for child-safe gloss UV varnish to protect the cardboard and add to its longevity. Typically, they are printed with two rounded corners to avoid pointy edges accidentally poking a child’s eye or other part of the body. Only a small handful of printers in North America specialize in board book printing. The process requires specialized equipment and the printing and binding are expensive. Callawind uses overseas book printing in China for the highest quality at a reasonable cost. Opt for a smaller book size. The less art board you use, the less each book will cost. See if you can reduce the number of spreads. This goes back to less artboard = less cost. Print overseas with our board book specialists and save about 40% on the printing cost. Quote on gray board instead of white board to save about 50% on paper cost. Are you ready to self publish a board book and curious about board book printing costs? Check out our sample board book costs chart. Even in today's digital world, baby board books are still considered an important tool in "raising a reader," according to Scholastic. What's more, recent studies mentioned in a Scientific American article suggest that reading on paper versus on a digital screen may train our brains to be more attentive. Ug ug, our cave-dwelling ancestors got it right! Are you one of the many authors who are self publishing children's board books? In business for 23 years, Callawind Book Publishing offers complete self publishing services for children’s board book publishing, including graphic design for children's books. Please visit our website at www.callawind.com.